There was an interview with Vundavalli Arun Kumar and Jaya Sankar in Sakshi about Telangana and United Andhra. Vundavalli Arun Kumar clarified all the points raised by Jaya Sankar about Telangana. Few points in the interview: The text in italics is my commentary. Vundavalli: There was Telangana movement in 1969, and In 1972, when we had Jai Andhra movement. During that time, there were four Chief Ministers from Telangana. (P.V.Narasimha Rao, Velagam Jangala Rao, Chenna Reddy and Anjaiah). Why did not they give separate Telangana, when we ourselves asked to separate the state. It was Telangana leaders that made us united. Jaya Sankar: 68.5% of of Krishna River flows in Mahaboobnagar. 70% of fertile land is in Telangana. If we take the catchment area of the river, Telangana should get 68.5% of water. If we take the fertile land, we should get 70%. Bachavath tribunal gave 811 TMC of water to A.P. But, Telangana is getting only 100 TMC. Similarly, 79% of Godavari river is in Telangana. How much are we getting? Vundavalli: I live on the banks of Godavari, and had seen many floods. When there are floods, I used to feel like, why Telangana people do not stop some water and take it. Every year, more than 3000 TMCs of water is flowing to the sea. Why don't they take that water? The reason is, in telangana, the height with respect to sea level is very high. The heights with respect to sea level. If the height is very high, then water has to be lifted. (It is very expensive to lift the water to the height of Telangana area.) Because of less height, even if coastal areas do not want to get water, still, we get lot of water. That is the reason, why there were no projects in Telangana, and many projects on Krishna and Godavari rivers in Coastal areas. The irrigation area in 1956 and 2004 are as follows (in Lakh acres). The increase in the irrigation area is almost equal in Telangana and Coastal. In Rayalaseema, the situation is very bad, because of the height with respect to sea level. Jaya Sankar: Telangana gets more than 50% of the revenue from excise, forest, mines etc. From the area or population wise, we should get 42%. But, we are not getting our share. Vundavalli: If we take GDP Growth Rate, Per capita income, IAMR Reports, Human Index, Literacy rate or anything, Telangana is not backwards. For example, lot of water is required for producing rice. Godavari and Krishna districts have been in the first place for a long time. According calculations of FCI in 2009-10, after godavari districts, Kareemnagar is in third place. Nizamabad and Nalgonda are equivalent to Krishna district. If we take the districts which produce least, they are Visakhapatnam, Chittoor, Kadapa, Ananthapur, Prakasam. In the first 5 places, there are three districts of Telangana. In the last 5 districts, there are no districts of Telangana. Telangana is not backwards, and saying that United Andhra is the reason for its backwards is not at all true. Jaya Sankar: Just take the G.O. that was released four days back. Nabard released Rs.130 crore to Andhra and Rayalaseema, and Rs.9 crore to Telangana. How many times do we have to beg them to give what we should get? Vundavalli: Neither Central Government nor State Government have rights to spend money in whatever they want. Wherever the money is spent, there is Public Accounts Committee that manages this money. That is headed by opposition party member. That committee has right to validate all the proposals. Probably, the numbers that he is mentioning may be correct. Sometimes, few areas get more funds in few G.O.s and at other times, other areas get more funds. I can show you 100 G.O.s where Telangana got majority of funds. But, can we say that, only Telangana got entire money? For Nabard funds, we are yet to spend lot of money, and talking about it right now may not be correct. Jaya Sankar: We are always looted in everything including jobs, funds, water etc. Vundavalli: Was there any cabinet without ministers from Telangana? Did not we conduct elections in Telangana? Did we stop anyone from Telangana in anything? If something did not happen as expected, who should take the responsibility? Are the elected leaders in Telangana not responsible for that? Now, KCR is talking about Telangana. What did he do when he was in a prominent role in TDP at the time of NTR and Chandrababu? If he had really demanded then, atleast few would have solved by now. Did he talk even once about problems in Telangana before forming the party in 2001? Jaya Sankar: Movement is not just by KCR. We have been doing it for the last 50 years. Vundavalli: How many times, have you tried to solve the problems of Telangana in democratic way? Jaya Sankar: Nobody cares even Supreme Court Orders. No need to speak of normal MLAs. Don't you know about the situation of Telangana? Do we have to ask specifically? Vundavalli: Corruption, Cheating, Looting etc., are there in all the places. It is not specific to Telangana. There are many things done to reduce those. We are somewhat successful in that. That's why this increase in Human Index Rates. There are poor people everywhere. They can be from Vijayanagaram or Anathapuram or Adilabad. Government never considered the people from Coastal, Rayalaseema and Telangana regions differently. But, this has been colored and started injecting into people of Telangana that, "Coastal area people are looting Telagana people". KCR is a Member of Parliament. He should raise the issues in Parliament. Instead of raising the issues there, he had chosen to do fasting and made the situation so bad. In my opinion, after 2009 elections, he faced problems everywhere. Whether is in the people's judgement, or from their party members. He wanted to be in limelight, and took up this. He knew that only with Telangana movement, he would be observed, and took up this fasting. Jaya Sankar: Why did Hyderabad became capital of United Andhra? Since, they did not have a capital, and told us that we would have all the rights. That's why we allowed them. Now, they are saying that, they developed the capital, and are asking for making it as union territory. If we have to do that, then make Mumbai, Kolkatha and Chennai as Union territories first, and then ask for Hyderabad. Vundavalli: When we say, Hyderabad is the capital, it means, we came to your home. For the last 50 years, we thought it as our capital. Eventhough we had problems in 1969 and 1972, still we are staying peacefully till 2000. Everyone knows that Telangana movement is strong in Telangana. But, you should not say that, you would move andhra people out of Telangana, or you would destroy andhra hotels, or you would stop andhra people from making movies. There is a big difference between Mumbai, Chennai and Hyderabad. When Andhra state is formed, Telugu people had asked for a separate state, and that's why Andhra had to give up Chennai. When Gujarathis asked for a separate state, they had to give up Mumbai. Now, Telangana people want separate state, they are asking andhra people to give up the state. This is ridiculous. If we allow this kind of separation, and if the same thing repeats, then the country would be in very bad situation. For example, Telangana takes Hyderabad completely, and Andhra people formes the capital at Kurnool. After few years, if Rayalaseema people asks for separate state, do coastal area people have to give up capital again? If the same thing happens, and if we form capital at Visakhapatnam, and then if north coastal people demands for a separate state, do South coastal people have to give up the capital again? This is not sustainable. If anybody is asking for a separate state, they have to give up the capital. It should not be made even as Union Territory. The capital should exclusively belong to the people who are not asking for separate state. Jaya Sankar: To develop the film industry, we gave land, water and current. According to government rules, the land should be used only for the given purpose. But, the andhra people are making it as real estate, and artificially increasing the prices. Because of that, now, we cannot buy any land. They did not encourage the artists of Telangana. Even there also, there is dynasty rule. Don't we have handsome people? Are they heroes, and are we fans? That's why these riots. Vundavalli: That's why do you stop movie shooting, and destroy everything? There is government in India. Government should take action according to the rules. This is not the reason for riots. This is only an explanation for the riots. The only reason is, they are andhra people. It is absolutely wrong for a political party to support these riots. If we have these many problems even before division, what would be the situation after division? Does Jaya sankar think that, the producers have so much respect for all the people of andhra, and give chance to only andhra people as the main artists? There is nothing stupid than that. If I am making a movie, without any second thought, I would give main roles to the people I like. Not the favorites of Jaya Sankar or KCR. Most of the time, the people I like would be in my relatives or friends. If I am from andhra, most of my relatives also would be from andhra. If I am from Punjab, then most of my relatives also would be from Punjab. Does he think that, when Allu Aravind is making a movie with a budget of Rs.40 crore, he should give chance to a Telangana person instead of his brother-in-law's son? Jaya Sankar: This movement is going for the last 10 years. Did we do anything before. Now, only they are doing. Why? Because, they cheated us. If anyone normally comes and stays here, then we welcome them. What we are saying? If you come here for living, we will save you. If you try to rule us, we don't allow you. Vundavalli: Maoists are extremists. They take lives of people. If you also say that, your philosophy is also same, then there is nothing that I can say. You say democracy, and then you do riots, and then you only say that, you would save us. How is it correct? Who are you to save us? In this country, anyone can go and live anywhere. If you are saying that, you would save in Hyderabad, it means you have created an environment, where one cannot live in Hyderabad. The sentence "We will save you" is itself dangerous. For better administration, we can separate. If you ask andhra people to leave, then obviously, there would be a question of Hyderabad. If you see the history, when andhra was separated from Madras state, people in Madras did not feel insecure. Even now, there are many andhra people in Coimbatore. Till some time back, even the MP there also was of Andhra. When Andhra was separated, there was problem with only language. But, there was no insecure feeling. But, the same thing (security) is not there in Hyderabad. That's why this became the main topic. Otherwise, Hyderabad would have been one of many topics. The real democracy is, in front of crores of Telagana supporters, one person should be able to raise and say that, he would support United Andhra. In the same way, in front of many United Andhra supporters, one person should be able to say, Jai Telangana. Can anyone say Jai Samaikya Andhra infront of any TRS activist? Lagadapati Rajagopal made one very good song on United Amdhra. This is one of the best songs that I have heard in the recent time. I hearty congratulate him for making this song. This song was composed and sung by Dr.Ghazal Srinivas. In A.P., the statistics say that, maximum voting percentage comes from slum areas and villages, and the least voting percentage comes from rich areas and educated people. The middle class is in between. In cities, the voting percentage is always low, and in villages it is always high. For local elections, the voting percentage at villages cross 90%, and in the last GHMC elections, there were many divisions which got less than 30% voting. Even if we go at the polling booth level details, one can easily observe that, within the city, the slum areas have higher polling percentage and high class areas have lower polling percentage. Many people are getting elected, eventhough less than 10% of the total voters are voting for them. If there are 10% educated people in the division/constituency, then they can even make their candidate win in the election. Even if the educated people do not have good political knowledge, they atleast know at broad level. They can tell which party is sustainable in long term, and which is doing more development compared to others. If all the educated voters vote for the better party, then the better among the bad would be elected instead of the worst among the bad. Not all politicians are bad. Most of the good politicians are not winning in the elections. Among the people who won in the elections, they don't get ministries. Even if they get it, they get with the condition that they will not have any control on major decisions. If there is only one good politician in the assembly/parliament, he/she cannot do anything. They need support from other MLAs/MPs to do anything major. If everyone votes for a party, which is better among the others, then the system would be automatically improved. If all educated voters vote, then automatically better party would be elected, and the system would be improved. Krishna and Guntur districts have the highest literacy rate, and has the highest pass percentage in the entire Andhra. Mahaboobnagar has the lowest literacy rate, and has the lowest pass percentage in the entire Andhra. That itself tells how backward Telangana is. So, we need separate state for Telangana. Fine. We will send 1000 quality teachers from Krishna and Guntur districts to Mahaboobnagar. They will improve the education there. No way. For any job in Mahaboobnagar, we need to recruit from Mahaboobnagar only. We cannot give our employment to Andhra people. These andhra people are already dominating in Telangana. Nobody is interested in implementing 610 G.O. We cannot give any more chance to them. Get lost. My manager asked me to use a new technology in the project. KCR wanted to have a separate State for Telangana. I knew that it is not good for the project to use that technology. Chandrababu knew that, it is not good to separate Telangana. I told the same in nice words to continue with the present way. Chandrababu told the same in nice words to continue with the present way. The manager did not listen to those, and insisted to use the new technology. KCR did not listen to those, and insisted to have a separate state. If I have to convince on that, I need to spend a lot of time and effort, and I know I can disprove all the uses that were claimed by the manager. To save myself, I did not argue for this. KCR joined with Congress. Congress is also not interested in Telangana. But, to convince general public, it takes lot of time and effort. To save themselves, Congress did not argue for this. If I use the new technology, project will have serious problems. So, I just dragged it without doing anything on that front. If Congress gives the separate state, it will have serious problems. So, Congress dragged it without doing anything on that front. The manager was keep on saying to use new technology, and I was keep on dragging it. KCR was keep on saying to have Telangana, and Congress was keep on dragging it. The manager scheduled a meeting for this, and talked in such a way that, team members felt, it is better to keep quiet rather than arguing. They thought, when there is a firm decision on this, then they would talk. No need of wasting everyone's time at this point of time. But, the conclusion that manager got was nobody is opposing to that. There were many committees scheduled for this, and everybody kept quiet. They thought, when there is a firm decision on this, then they would talk. No need of wasting everyone's time at this point of time. But, the conclusion that everyone got was nobody is opposing to that. Another manager said, take some decision soon. Don't drag these things. Dr.Jayaprakash Narayan and CPM said, take some decision soon. Don't drag these things. I told them that, I would take a decision soon, but did not proceed on this, because I knew that, people are not in a state to understand what am I saying. Congress told them that, they would take a decision soon, but did not proceed on this, because they knew that, people are not in a state to understand what they are saying. That idea had natural death because of zero co-operation from everybody else. People expected to have natural death because of zero co-operation from everybody else. Had the manager took decision to go with the new technology, everybody would have opposed to that. Congress took decision to introduce the bill for Telangana, and everybody started opposing to that. The manager would have asked, why did not we tell the same before when we had conducted meetings, and we would not have answer. Telangana supporters are asking those who are opposing, Why did not they tell this before, when there were committees, and they don't have answer. In another project, when the management was thinking in wrong direction, I told the director that, if they want to continue in that wrong direction, move me to some other project, eventhough I was the senior most member in the team, and moving me out of the project will have significant impact on the project. Still, I told like that to take the correct decisions for the project. Me Moving out of the project will have less negative impact than the project going in wrong direction. Many members of Assembly, Council and Parliament resigned for this, eventhough it means collapse of the government. They had taken that decision for the state. Members resigning from the government has less negative impact than forming the state without clearing all the problems. Congress is exactly doing what I did on one of my previous projects long time back. I cannot oppose Congress atleast in Telangana issue, unless they give Telangana without solving the problems. An economics professor at Texas Tech said he had never failed a single student before but had, once, failed an entire class. That class had insisted that socialism worked and that no one would be poor and no one would be rich, a great equalizer. The professor then said ok, we will have an experiment in this class on socialism. All grades would be averaged and everyone would receive the same grade so no one would fail and no one would receive an A. After the first test the grades were averaged and everyone got a B. The students who studied hard were upset and the students who studied little were happy. But, as the second test rolled around, the students who studied little had studied even less and the ones who studied hard decided they wanted a free ride too; so they studied little. The second test average was a D! No one was happy. When the 3rd test rolled around the average was an F.
The scores never increased as bickering, blame, and name calling all resulted in hard feelings as no one would study any longer for the benefit of anyone else. All failed, to their great surprise, and the professor told them that socialism would also ultimately fail because under capitalism when the reward is great, the effort to succeed is great; but when the government levels the playing field and takes more of reward away; no one will try or want to succeed as much as before. 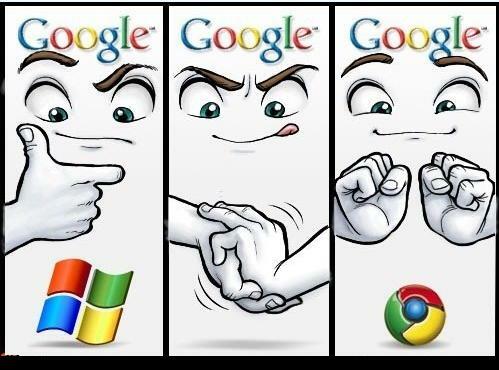 Till Firefox 3.0, it was very easy to add a new search engine. One just needs to click on Manage Search Engines, and then click on Get More Search Engines. It would display around 30 search engines, and we need to select one and it would be added. Starting from Firefox 3.5, they made it complicated. If you select that option, you would get hundreds of options, and it becomes very difficult to find the correct one. I wanted to add dictionary search engine, and I have done the following for this. Installed Add to Search Bar. Righ clicked on the search box, and selected Add to Search Bar. It got added, and I can search in dictionary from firefox search. We can do the same for any other website/search engine. 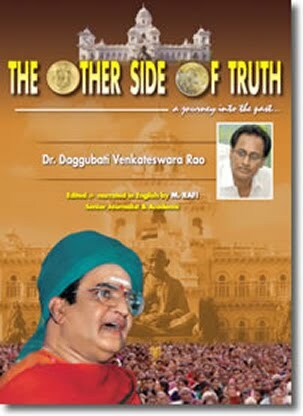 Dr.Daggubati Venkateswara Rao has written a book titled, "The Other Side of Truth". 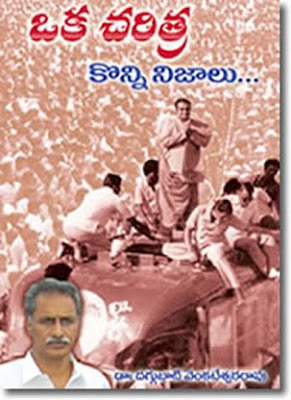 The telugu version of the same book is "Oka Charitra - Konni Nijaalu". If a person is expecting some money out of their work, then it is expected that, they may not release that work for free. If their goal is not to earn money from their work, then I don't understand why do they copyright it? If their intention is to propagate their message, then by releasing the book for free, the message would be reached to many more people. Unfortunately, many people are not releasing their books for free, eventhough publicly they say, money is not the criteria, but, internally, it was a criteria for them. I hearty congratulate Dr.Daggubati Venkateswara Rao for releasing this book for free in both English and Telugu. I would like to thank Sarojini Reddy for informing me about release of this book. When Sakshi news paper was started, Congress was very happy for getting one news paper exclusively for themselves. They thought they get very good publicity by that news paper. But, now, Congress might have realized the problem. For the last 1 month, there are significant no.of news items in the first page about failures in the government. Almost everyday, it says that, the Government is not doing this thing or that thing. Eventhough the things that government is not doing do not have any significant impact, still, Sakshi is trying to highlight all the negative aspects of the government. Sakshi is owned by Y.S.Jagan, (S/O, Late C.M. Y.S.Rajasekhara Reddy). When, Dr.Y.S.R was C.M., Sakshi used to give good publicity to the government and to Congress. After the death of Dr.Y.S.R, Jagan wanted to become C.M. But, since he has not been made C.M., he is trying the footsteps of his father to defame the government, so that the government falls, and he can try to become Chief Minister. Dr.Y.S.R has done similar things back in 1990-92. He tried his best to become C.M. between 1990-92. But, Party high command did not agree then. Finally, he got hold in 2004. This is the famous quote that I have been hearing about Vajpayee for a long time. I feel, whoever says that, does not have even basic knowledge about real politics. They know only dirty politics. The reason why these so called famous journalists give this type of comment was because, BJP is a party for hindus, and Vajpayee is a secular. Before deciding whether a party/person is secular or not, they have to see secularism from all aspects. It is unfortunate that, in India, if anybody supports any religion other than Hinduism, they are called as secular people. The supporters of Hinduism are called as Hindu fanatics or something similar. By the way, this article is not about religion and whether BJP is secular or not. Shyam Prasad Mukherjee was a freedom fighter. He and Nehru were not aligned in many principles and the way of executing. Shyam Prasad Mukherjee supported Free Market Economics, where as Nehru supported Socialist economics. The way Nehru handled the issue of Jammu & Kashmir was not liked by Shyam Prasad Mukherjee. There were many difference between them, and finally Shyam Prasad Mukherjee started Bhartiya Jana Sangh in 1952, Which later on became Bhartiya Janatha Party (BJP). Even after 57 years, BJP still has the same goals and vision set by Shyam Prasad Mukherjee. The party is lead by the idelogies rather than People. BJP and Left parties are the only parties that are lead by the ideologies, where as all the other parties in India are lead by a person or a family (considering only the parties that had taken power atleast once). Congress followed only Socialist Economics till 1991. 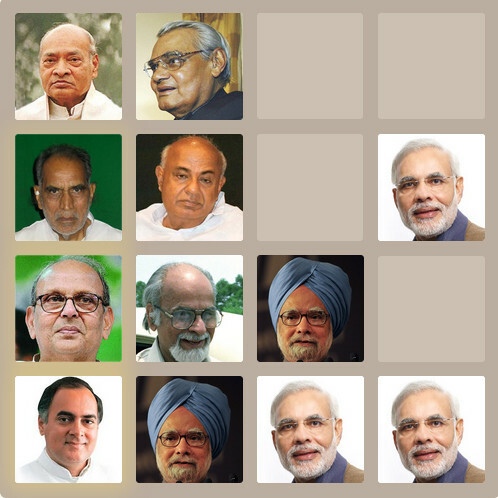 After 1991, P.V.Narasimha Rao and Manmohan Singh changed the policies to Free Market Economics at the center. But, most of the Congress governments at states still follow the socialist economics policy only. On the other hand, BJP has always been following Free Market Economics since the beginning in 1952. Regarding Jammu & Kashmir issue, Congress and BJP have exactly opposite opinions since the very beginning. There is no change in the opinions of either. If we take the way the currency was devaluated in both Congress and BJP governments, one can find significant difference. Congress government devaluated rupee, whenever they felt like. But, BJP government devaluated only when there was no other option. There are significant differences between both the parties in their policies on economics, governance and many others. Religion is just one small thing in their total vision. Unfortunately only that is projected significantly due to may reasons. Vajpayee is completely aligned with the policies of BJP. There is no other party in India which had similar policies. If they take all the policies of all the parties, and match with the policies of Vajpayee, he would be very close match with BJP, and not at all a match for any other party. I cannot understand on what basis, these so called famous people claim that Vajpayee is in wrong party. Generally, in many elections, parties give money to the voters to vote for their party. Those whoever is giving money do not have any of knowing whether that person voted for their party or not. Still, they give money. Most of the voters who take money (atleast the uneducated voters) are sincere in their voting. If there is a person, and if he gets money from three parties, then he would vote for one of those three parties with his own discretion. All the three parties know this. Still, all of them give money. The reason is, if they give money, then they may get vote or they may not. But, if they don't give money, then they will surely won't get the vote. Let's suppose that person has a family, and his family consists of 3 voters including him. If all the three parties give equal money to all of them, each party would get one vote each from his family. If the parties give unequal amounts of money, then they get proportionate votes based on the money received by the entire family. If his family consists of 4 voters and the three parties give equal amount of money, then the three parties get minimum one vote each, and the fourth vote goes to one of them depending on other factors. Most of the uneducated voters are sincere in this case. Recently I came to know of a different way to buy votes. The candidate announced that, he would be giving Rs.5000 per family. The family has to give their ration card to him, and he would note down the no.of voters in their family and gives Rs.5000 to them. If he gets more no.of votes than the no.of voters to whom he gave money, then he would return the ration cards of all the voters. If he does not, then he would tear all the ration cards. Since, no Middle class family or poor family afford to lose ration card, he won eventhough he contested as an independent from a constituency which is in outskirts of a city. The simple way to improve education in the state/country is, putting all the education ministers in coma for 5 years, and repeat the same after every elections. Recently, A.P. state government introduced relative grading system in 10th Class. Till now, in 10th class, if the percentage is more than 70%, it would be first class with distinction, if it is more than 60%, it would be first class, and so on. Now, the plan is to give relative grading for all the students. The top 12.5% of the students would get A1 grade, next 12.5% of the students would get A2 grade, and so on. They give till D2 grade. With this new scheme, if anybody gets 62% of marks (considering 2009 results), he/she would get C2 grade. Government never understood the effect on the students and parents due to these changes. For corporate schools, this may not make a difference, but, in all the small to medium size schools, this makes a lot of difference. Till now, if anyone gets more than 60%, they would be happy that they got first class. If they get more than 70%, they would be even more happy that, they got distinction. Now, if anybody gets 62% of marks, he/she would get C2 grade, which is 6th grade from top. This does not look good for many. Parents would be unhappy and force their children to get better marks. Pressure increases for both parents as well as children. Not only that, this grading is relative grading. It depends on other students marks as well. If they know that, if they get 80%, they would minimum get this grading, then they try for that. But, if it is relative grading, and if they don't have any way of knowing, and if there is pressure from parents and teachers to score some minimum grade, it would increase the pressure on the student significantly. Government thinks this increases competition. They do not have minimum common sense that, these will not make sense, when million students are attending for the exam. If Million students are writing the exam, and if they start grading like top 12.5% etc., it will only increase the pressure. Another absolute contradicting thing that government is doing is, it is trying to stop corporate schools from publishing their top marks. If corporate schools publishes the top marks in their school, government feels that, it creates unhealthy environment and increases the pressure on students as well as parents. This is contradictory to the above. But, they claim that they are improving the education where as they are destroying it. 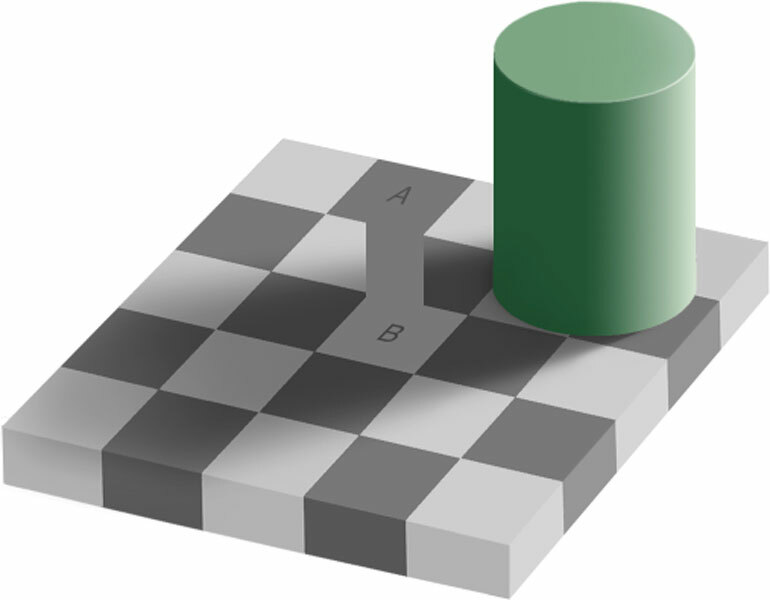 The squares A and B are of same color. 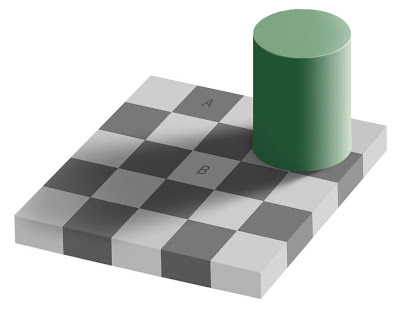 To prove that they are of same color, few websites show the connection between squares A and B. But, in those images, the color of the squares look differently from the above image. That is also because of illusion. To verify the colors, Open any image editor and check the colors of both the squares. There was a Japanese who went to India for sightseeing. On the last day, he hired a cab and told the driver to drive to the Airport. During the journey, a Honda drove past the taxi. Thereupon, the man leaned out of the window excitedly and yelled, "Honda, very fast! Made in Japan!!. After a while, a Toyota sped past the taxi and again the Japanese man leaned out of the window and yelled, "Toyota, very fast! Made in Japan!" A while later a Mitsubishi sped past the taxi. For the third time, the Japanese leaned out of the window and yelled, "Mitsubishi, very fast! Made in Japan!". The driver was a little mad, but he kept quiet and this went on for quite a number of cars, finally, the taxi came to the airport. The fare was 900 rupees!!! The Japanese exclaimed, "What?... so expensive!" There upon, the driver yelled back, "Meter Made in India, VERY VERY FAST!" But, with this many features like resizing/full screen will not work. A library should be developed in such a way that, irrespective of who is using it, how they are using it, it should have the same behavior. The consistency of the data/contract should be always maintained. For example, if a library is developed for reading/writing some data in the given format, then it should not allow any user to do anything more than that. If the main API is calling two public classes one for validation, another one for reading/writing data, then this library can be misused. User can directly use the public class that is used for reading/writing data, and can read/write by escaping all the validations. That can lead to many inconsistencies in the data. For that purpose, all other classes/methods should be given minimum privileges, so that other libraries cannot access those classes/methods. Let's suppose, if the developer of the library changes one internal method from private to public, then potentially, it could be used by many developers. Writing comments, and clearly mentioning in release notes will not stop the developers from using that public method. If that method is not doing certain validations and doing the processing, then it may lead to an inconsistent state of the application/data. If the code is sufficiently complex, then debugging would become very difficult. Most of the time, developers debug in such a way that, there was some problem in their code, and they don't try to debug the underlying libraries. If the inconsistency was caused by the library, then user would spend significant time for debugging. Few non-technical people say that, developers should read the documentation and implement accordingly. They should understand that, if a developer wastes significant time because of a problem in a library, which can be avoided in the first place, then they will never support that library again. If you are supposed to expose an API for certain functionality, and if you decided to develop two libraries, where first one is exposed to the user, and second one is used by the first library, then understand that you are doing wrong (or may be a blunder), unless your requirement is one of the rare scenarios which occurs less than 0.01% of the cases. If you develop two libraries, and the first library uses second one, then most of the time, the following may happen. Since, there are two different libraries, both would have few public APIs, and any user can call those, unless some convoluted security restriction is applied. But, if we apply that kind of security restriction, the application would become very unclean and unmaintainable. If you are doing something in the first library, and then calling the second library to finish it, then it is possible that user can call the second library directly and finish the work without doing the work done in the first library. If the first library contains only validations or similar operations, then the user will not see any problem initially, but later on the entire application would be in inconsistent state. If you are doing the final thing in the first library, and calling the second library for validations before doing the final operation, then it is possible that, they can replace the second library altogether, and may do everything without the validations. That also causes the application to be in inconsistent state. If you implement few operations completely in the first library, and for other operations, if you are calling the second library, then, you should think why you need to do like that. Instead, you should separate them completely, and say that, if user wants to do first set of operations, then use first library, otherwise, use second library. In another case, your first library may be just a wrapper, and it just calls the APIs in the second library. Then, there is no use of the first library, and it can be removed very well. If first library is used just for business logic, and is not aware of database, and second library is used for db operations, and if the operations are complex, then there may be disadvantage in doing that. If there is an API in the first library, and if it is not aware of the DB, then it may have to do all the handling of synchronization, locking, or atomicity in that layer itself. But, if it is moved to DB layer, then the database can handle all those, and developer does not need to them. If you are using two libraries for essentially a single purpose, then you should think many times before going ahead with that. Of course, this is not applicable, if both the libraries have different security modules. For example, if you are exposing a webservice, and using another library in that, then you don't need to worry about that library, because user cannot call it directly. It would be applied only to the libraries where the security context is same. Having said that, I can see one very good advantage with having multiple libraries. We can write extra-ordinary design docs with many flowcharts, components and class diagrams. Those who do not write code full time would be overwhelmed with that, and they appreciate it very much, and you may get a promotion immediately. These are few suggestions for those who write blogs. It would help more people to read your blogs. Setup E-Mail subscription by using feedburner. Not everyone uses feed readers like Google reader. Having email notifications is a good option to reach all your readers. Enable Feeds with full content for posts as well as comments, unless you clearly know what you are doing. Eventhough this is the default, still I am explicitly saying because I know few people, who think that giving least permissions is more secure, and they disable it for that reason. Don't post in bulk, because you had not posted for a while. Use the options of schedule post and post it uniformly. If you are planning to post after a month, and you have 4 posts now, then schedule to post one a week. That would be useful for your regular readers. If I see 4 posts from one person, I would be tempted to read them later. But, if it is single post, then I read it immediately. For more than 90% of my posts, I schedule to post in future. Enclose your text in between <p align="justify"> and </p>. By that, your text is aligned. Unfortunately, blogger does not align the text by default. We can add this in the template to apply to all posts. But, if we change the template to use other theme, and afterwards if you do any template changes, then the previous changes may go away. If your post is a generic one and is a solution for a particular problem, then try to use what users search for that problem, as the title of the post. By that, search engines give more preference to your post for that problem. If you are having tables in your post in blogger, then you may find significant extra space before the table. It is because, for every new line in between <table> and </table>, blogger adds one new line <br>. By that, there would be new lines before the table. Remove all the new lines in the entire html between <table> and </table>. If you keep everything in single line, then there will not be any extra space before the table. Hide the top navigation bar (banner) by doing the following. 2. On your Dashboard, select Layout -> Edit Html. Under the Edit Template section you will see you blog's HTML.